Jack Unterweger was the Roman Polanski of Austrian letters. He had been convicted of the sadistic murder of a young woman, but the smart set, including Günther Grass and Marxist "feminist" Elfriede Jelinek, thought his poetry was too accomplished for Unterweger to remain behind bars. About a dozen subsequently dead prostitutes would have preferred they not advocated on his behalf. Unterweger’s brutal and notorious life gets a glitzy screen treatment in Elisabeth Scharang’s Jack (trailer here), which screens again this morning at the 2015 Toronto International Film Festival. Unterweger’s predatory savageness is not exactly seen in the opening sequences of Jack, but there are no mistaking the grisly consequences. However, Scharang will keep that Unterweger bottled up for most of the second act. 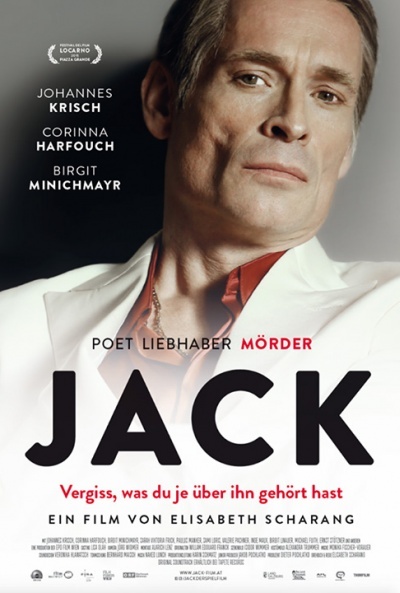 Since Unterweger wrote some lovely poetry and a confessional autobiography, Schäfer’s death was therefore okay with Jelinek et al, who are saved the indignity of appearing in Jack. After serving his minimum sentence, the world is laid at Unterweger’s feet. He has a fat literary contract waiting for him and a luxury flat paid for by his soon to be mistress, Susanne Sönnmann, a well-heeled and very married architect. Hipster editor Marlies Haum will pave his way into fashionable society, provided he revisit the world of pimps and prostitutes he knew so well, as a correspondent for her magazine. Everyone seems to be obsessed with Unterweger, even though the new book is not selling nearly as well as the prison memoir. However, when his toxic mother reappears, it is a bad sign. Sometime thereafter, the Vienna police start to suspect him for the murder of a string of prostitutes. They can even match dead bodies to his international travels. While Unterweger’s partisans still question his guilt with respect to the prostitute spree killings (his nine convictions not withstanding), Scharang hardly seems interested in the matter. Instead, her film is sort of the narrative equivalent of Bruce Weber’s Chet Baker documentary Let’s Get Lost. Both present a nonjudgmental portrait of artists with deep-seated hostility towards women, preferring to focus on their scarred surface beauty. At times, Jack looks like the sort of layout Weber, the fashion photographer might have shot. Yet, Johannes Krisch plays Unterweger with such a piercing psychopath’s stare, you have to wonder how everyone around him manages to not get it. Krisch’s Unterweger is a microwave of rage, primed to explode. If his icy demeanor and casual cruelty are not clues enough, his old school pimp-hand wardrobe ought to send some kind of signal. In contrast, Corinna Harfouch (who could pass for Dame Helen Mirren’s younger sister) seems too smart and sophisticated to fall for Unterweger or to have anything to do with his world of celebrities and low lives. Still, she invests Sönnmann with an earthy sensuality that really sets the tone for the film. If nothing else, Scharang’s Jack certainly looks right. Cinematographer Jörg Widmer makes everything hazy and dreamlike, while production designer Isidor Wimmer perfectly replicates the 1990s Euro club milieu. Nevertheless, Scharang seems intent on embracing an amoral, hedonistic vision until hedging at the last moment, leaving us to wonder just what was the whole idea of all that? Fascinating to observe, in a clinical way, but rather distasteful to digest, Jack is probably too arty for true crime audiences and too lurid for art house patrons. It is a real quandary, so use your own judgement if you are still in Toronto, when it screens again this morning (9/20), as part of TIFF.